Hi everyone - Busy times around here getting things kitted up for my first holiday classes in Waxahachie, TX. My sister also came for a visit which made for not only some fun times but a HUGE help in getting the kits processed for shipping this week. 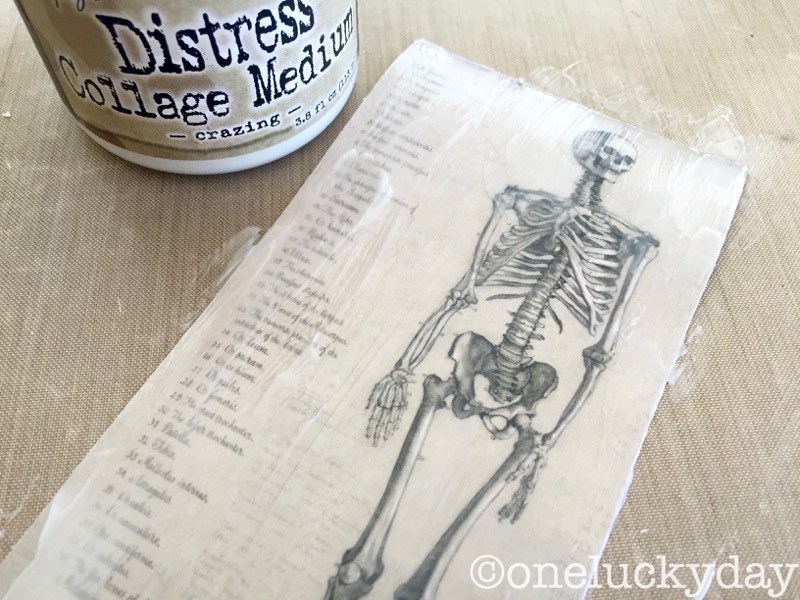 Please be sure to check the blog side bar to see where I will be teaching this fall! 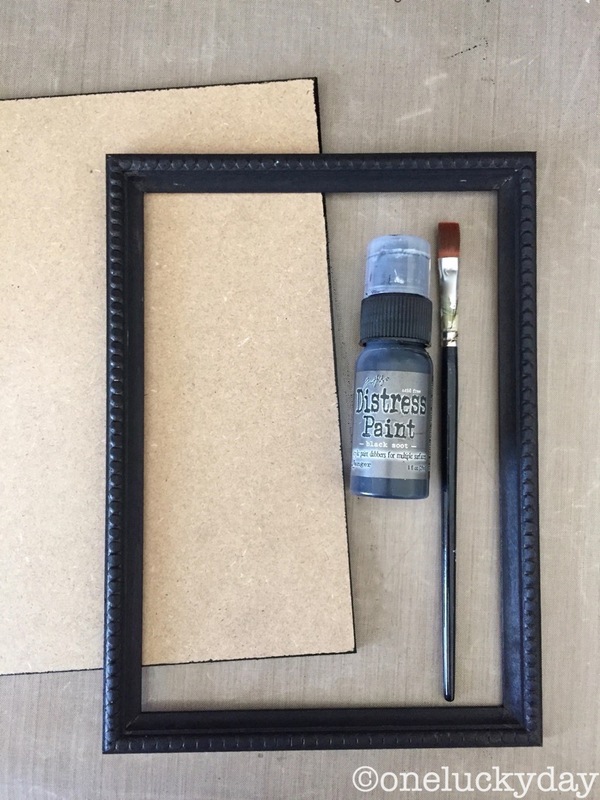 Start by painting the frame and base of the Framed Panel with Black Soot Distress Paint. It will take two coats to make it nice and black. 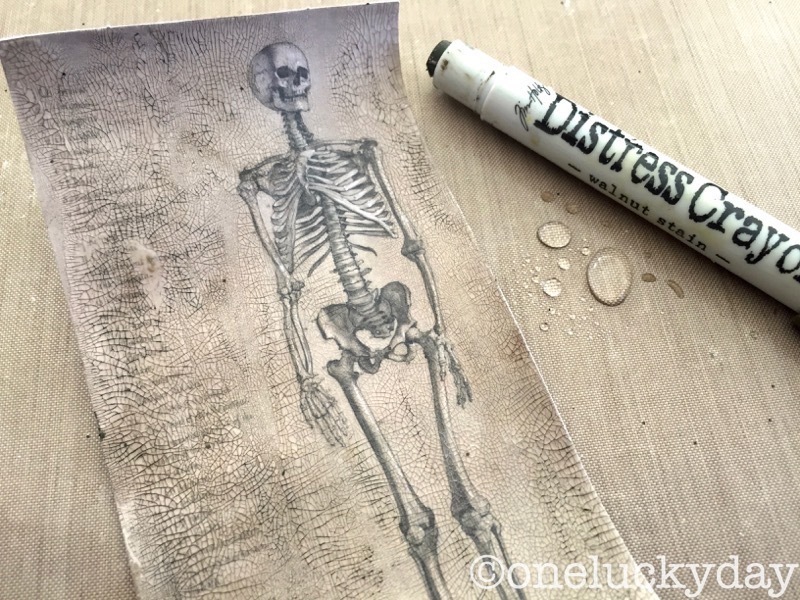 I chose a skeleton from the Halloween Ephemera pack as a focal point. I cut a piece of chipboard to fit and painted the sides black. While the chipboard is drying, paint a nice layer of Distress Collage Medium Crazing over the surface of the ephemera. Let this dry for at least an hour or more. While the Crazing is drying, I cut black cardstock using two Thinlit Halloween dies: Halloween Words -Thin and Twisted Edge. I think the Twisted Edge is already a favorite of many people because I see it being used a lot! As for the Halloween Words, I just cut some of the words and then made up my own phrase for this project. A great way to stretch a seasonal die!! 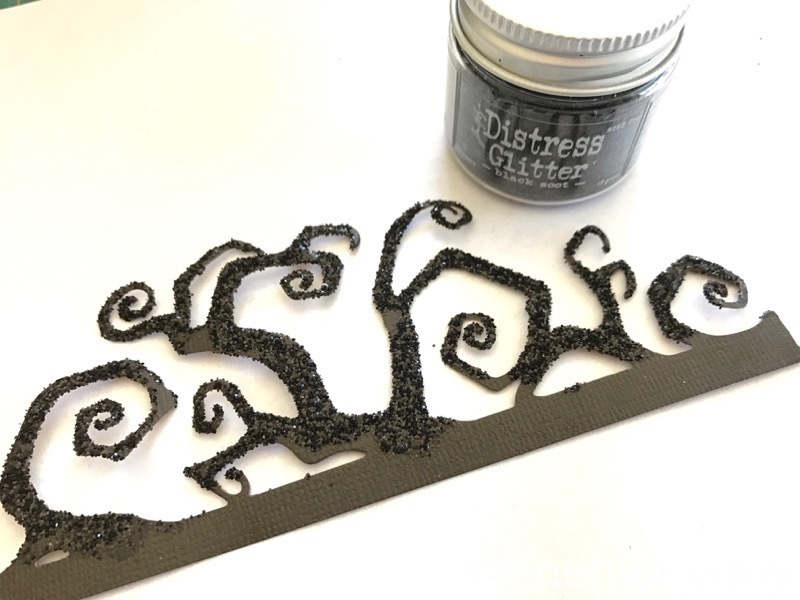 Add Distress Glitter to the Twisted Edge. Let Dry. 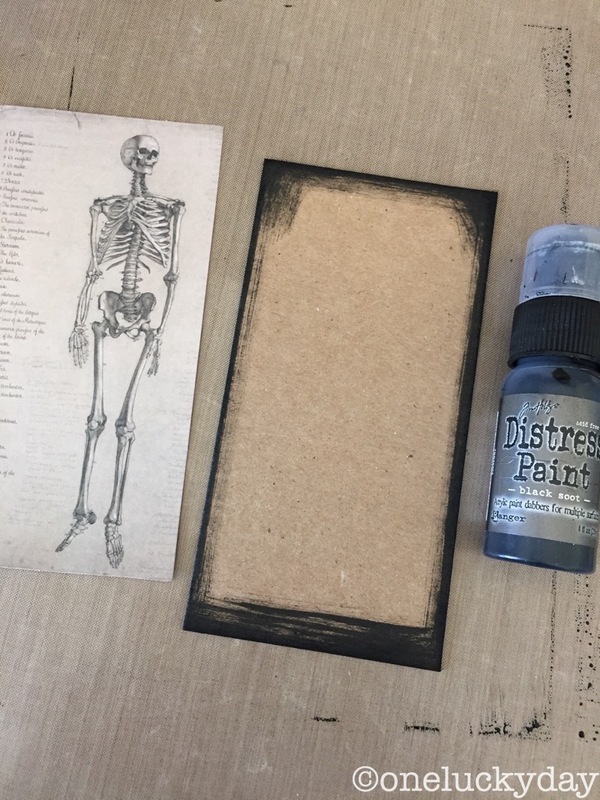 Once the Crazing is dry to the touch you can color it with a multitude of Distress Products...today I'm using Distress Crayons to color the tiny little cracks that the Crazing has left. I scribbled over the surface and (with a wet fingertip) rubbed the crayon into the cracks. INSTANT aging!! I wanted to use the new bones (Boneyard) from the idea-ology Halloween release. These are seriously cool. Where does Tim come up with these product ideas? 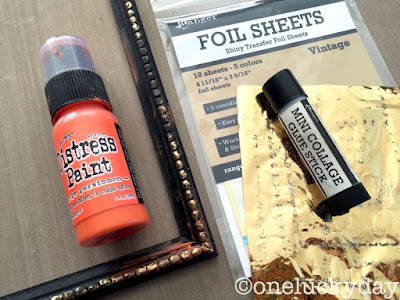 You know me and my favorite red Eclectic Elements Craft Thread. I can't get enough of this stuff! I decided that since the large bone was the same size as the femur in the ephemera I would sew it right over the image. A little Dr. Frankenstein I know, but I couldn't help myself. I added the piece of chipboard I previously painted to the back of the ephemera (see the tiny black edge?). I also added Remnant Rubs (Gothic) to the bottom of the piece. You might think that it would be hard to add Remnant Rubs over Crazing, but it's not. They rub on very easy using the Remnant Rub Tool. 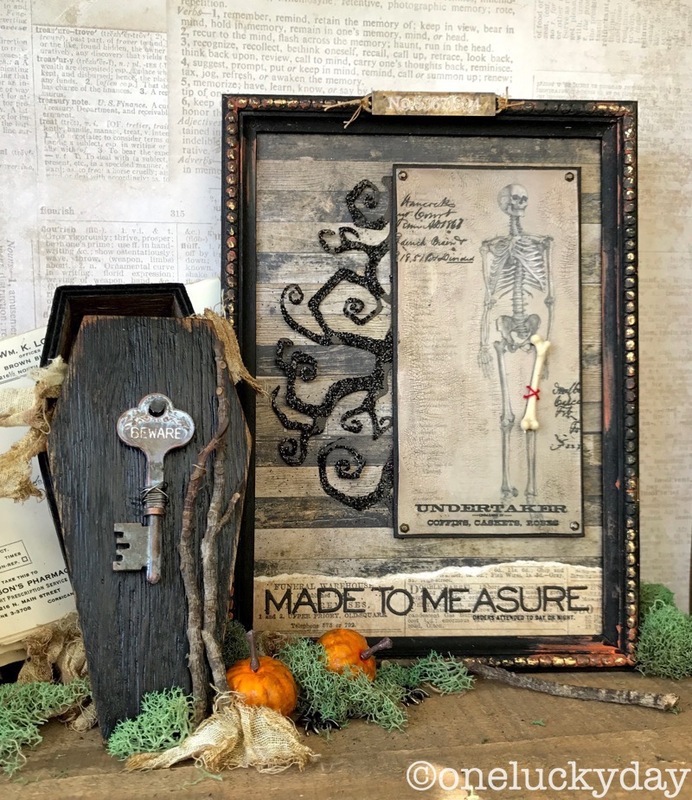 A little more rubs on each side...love the black script adding to the ephemera (one of my favorite parts of the Halloween Remnant Rubs). Something you won't notice in the photo is that I added a very thin layer of Collage Medium over the Remnant Rubs - this helps to hide the "halo" around the rubs and incorporate them so seamlessly that they appear as one with the paper. Add a couple Hex Fasteners to the top and bottom of the card. They come in two sizes in the pack - I used the smaller of the two. 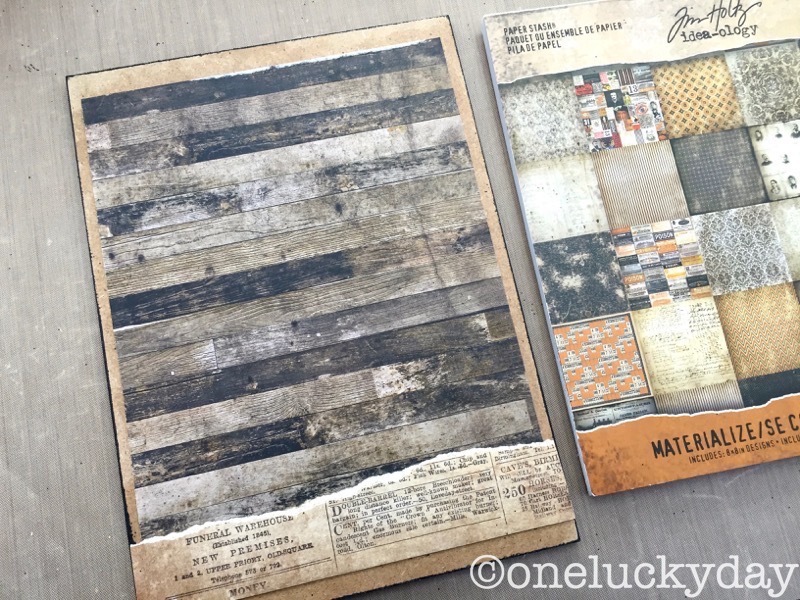 Adhere paper from the Materialize Paper Stash to the Framed Panel using Collage Medium. I used the "wood" looking paper and a piece for the bottom that has old advertisements. To prepare the frame, I randomly painted over the Black Soot with Ripe Persimmon Distress Paint. Once dry, I added glue stick to the dots around the frame so I could adhere gold foil. You have to rub really well but goes on perfectly random, which is exactly what I wanted. I used Slate and Mushroom Alcohol Ink to color the Word Band (Incantation). We have never had a Word Band with a number on it before - love this one and it's just perfect for this project. 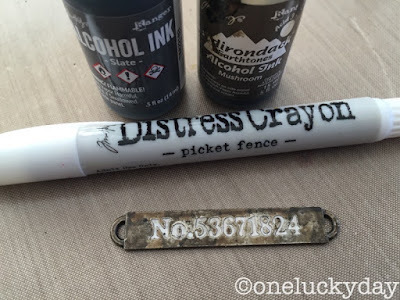 Once the Alcohol Ink was dry I colored in the number. I have a little trick to color in the letters/numbers on any Word Band. If you heat it with your Heat Tool for about 15 seconds, it heats the metal just enough to melt the crayon tip as your are coloring over the letters/numbers. Works every time. Remember to only heat it for 15 seconds so you do not burn yourself on the metal. Cut some string and add to each end of the Word Band. 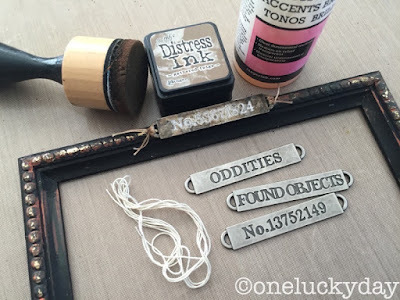 Use Gathered Twigs Distress Ink to color the string, then add it to the Frame with Glossy Accents. Now put all the pieces together to create a fun Halloween Panel. I figured the idea-ology wood Coffin box was appropriate for the display since I used the Undertaker Remnant Rub and my phrase, "Made to Measure". Another Remnant Rub that is perfect for this project..."orders attended to day or night"
For the Coffin, I painted it with Distress Stain then rubbed over it with Collage Medium. Once dry, I sanded the edges and inked with Gathered Twigs. 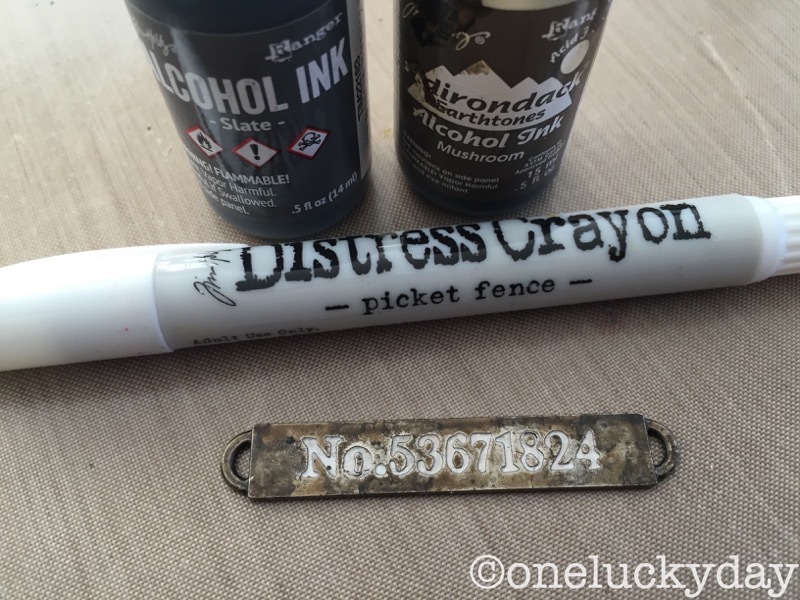 The Halloween Word Key was colored with Picket Fence Distress Paint and Mushroom Alcohol Ink. I nailed the key to the coffin lid with a carpet tack (which coincidentally looks somewhat like a vampire stake from the old Bela Lugosi Dracula movies). Perfect for a great Halloween display! for some of the idea-ology Halloween product. I will post the winners name on Friday, Oct 14th! how cool is this? and i'm a traditionalist...candy corn, all day, every day! Really? You want me to tell you my ONE favorite Hallowe'en candy? That's like telling you which of my children is my favorite. But if you insist ... it is Mars bars. I don't see them around very much, so they are truly a treat hen I can find them! By the way ... I love this project! Fabulously clever! When heating the word band and using the crayons...are you heating the word band before or after using the crayons? Ah...Halloween candy...Reese's peanut butter pumpkins for sure! Thanks for a chance to win some cool holiday goodies! susan I heat the word band for 10 or 15 seconds and then color with the crayon...the heat from the metal melts just the tip of the crayon and is flows into the word perfectly. OOPS ... I just fell ... in love - with that project !!! My favourite candies are Rockets . Sour sugar ... what more can I ask for ?? So creative as usual! Favorite candy is Dots! I love the Reese's Pumpkins. Not sure why but I do!! I also love this little grouping of Halloween cuties!!! You always make the best projects! I can't wait to finally unpack my new craft room so I can start making these fabulous things!!! Fun halloween project, you make everything look so easy! Love it!! I like those cheap, Smarties, sad to say, straight up sugar! Can't wait to see you in December at Whim So Doodle! So love all things created by you Paula! Have fun in Texas. I really like this idea I'm going to have to try some of it. Myfavorite candy the small nestles crunch bars. I really like a lot of your work Happy Halloween. OMG ... this is too cool; that foil touch and the bone... my goodness your creativity and techniques WOW me every time ! My favorite Halloween candy is the Brach's Autumn Mix ... it's not Halloween unless I've had some ! Oh, and my favorite Halloween candy is candy corn-yummy! love the project as always skillfully done...love it. 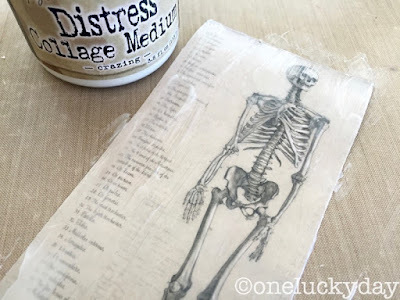 Great project....fav Halloween Candy Kraft caramels! I love the frame super cool project with so many techniques. That "femur" bone just cracks me up! What a beautifully detailed project! Fav Halloween Candy has to be candy corn especially if you eat it with salted peanuts - ends up tasting like a payday candy bar! Spook on Paula! that sounds like a good idea Kat! Brach's INDIAN CORN! Hard to find but worth the hunt. 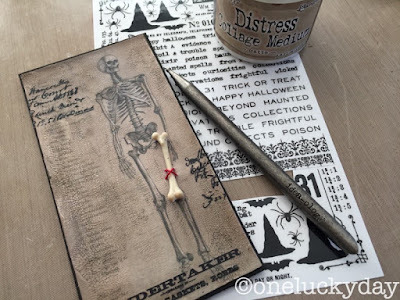 Such a great Halloween project Paula! My favorite candy for Halloween is candy corn. Great project Paula! I love the bone and the coffin. Candy corn is my favorite Halloween candy. 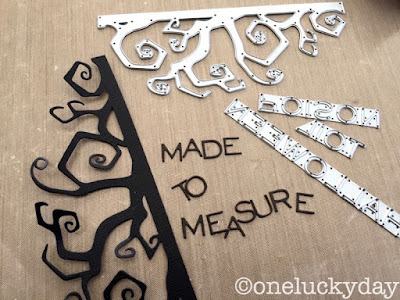 Another fabulous project that I want to make! Candy corn is a downfall for me this time of year...so thankful I usually buy enough to last for a few months. This is fabulous. I love the tree die! My all time favorite Halloween candy is candy corn! Spooky! Your imagination is inspiring. Favorite Halloween candy is those kit kat minis. One for me, one for the trick-or-treater! Fun Halloween display! 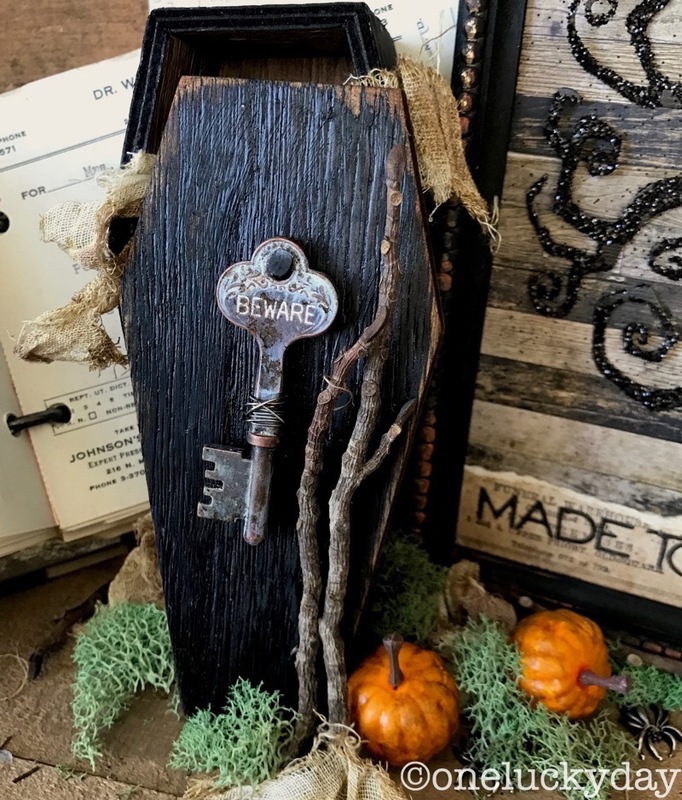 Love the key staked onto the coffin. Oh gosh, it's a toss up. Love me some candy corn but also like those cute mini milky ways. Thanks for the chance at the generous giveaway. Love this!! 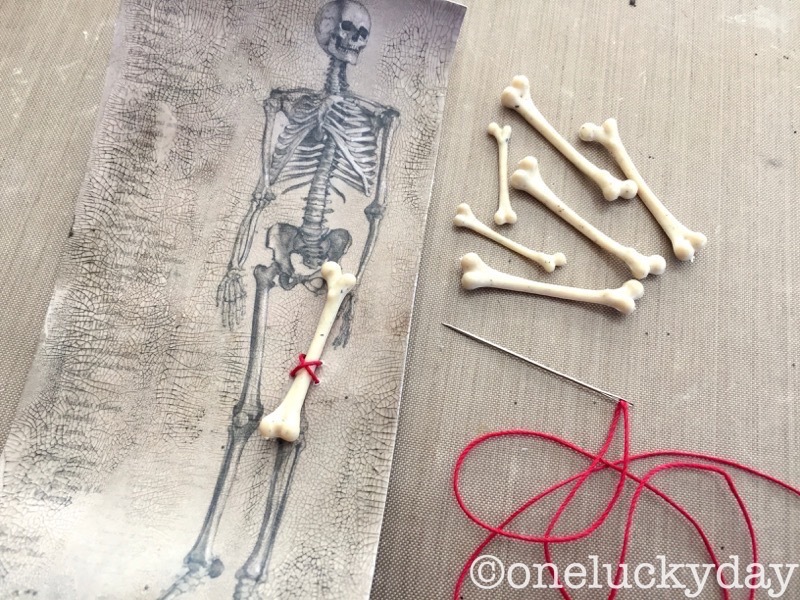 Will definitely being creating some skeletons with femurs!!! Kit Kats all the way!! Great project Miss P! My fave Halloween candy is candy corn. If my name is chosen, please, please pick another since Halloween isn't really my cuppa tea. this looks amazing! I am going to have to try to find some time in my schedule to copy some of your creativity. Halloween is my favorite holiday of all times. I have a small suitcase full of paper and embellishments - all Halloween! my favorite Halloween candy would have to be the pumpkin Reese's PB cups. Awesome project! and my favorite Halloween candy was always the mini boxes of Smarties. Happy Halloween!!!!! Favorite candy? Uhhhhhhhhhh.........tough choice. When giving out to trick or treaters, I always have to steal a red Tootsie Pop (or two). Now, for after Halloween, I always buy up a few bags of candy corn, and (as KAT mentioned) mix it with salted cocktail peanuts and it really does taste like a Payday bar, but even better. I don't know why. It's sooooo good. I usually put a jar of it at my desk at work and it never lasts. 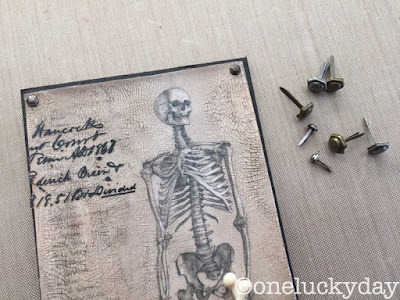 the paint and foil on the frame is worn to faux perfection, and that little cross-stitch to hold the bone is fabulous (still haven't seen any of tim's thread here in the wild - but it is on my "must have" list). I could never pick a favourite - the others might get jealous, find out, and stick-it to me while i'm sleeping - lol). So much chin! I'm definitely going to make this! Thanks for the excellent directions! Awesome Halloween display Paula. 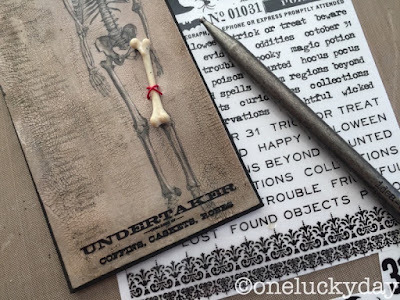 Fabulous details, especially the little bone! I think I am going to have to make one of these for myself ;) My favorite Halloween candy (if I have to just pick one) is Twix. Paula another awesome Halloween project! My fav Halloween candy is candy corn mixed with planters peanuts! Yummy! Love the projects! My favorite Halloween candy is caramel. Always love your work, it inspires me! My fav Halloween candy - Kraft Carmels. 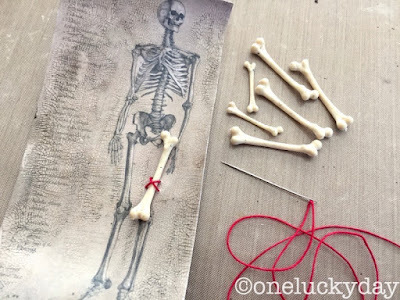 I love the humorous aspects you added to your project, and I don't just mean the bones! I love the four main candy food groups, but I think milky ways are my all time favorites. Great project with some inspiring technique ideas! I can't seem to get enough Candy Corn --the ones with the chocolate tips. very cool ideas - excellent project - my favourite fall candy? those little tiny chocolate bars... always worth it! Indian candy corn. I hate I wont be able to take the class in Waxahachie! We will be on our 1st cruise! Favorite Halloween candy is Reese's Mini Peanut Butter Cups. Someday I will make it to a class, it's on my bucket list. What a fun and cheeky project! So clever and creative. I love candy corn! Even though you can get it all year now, I only buy it at Halloween. This is so cute and eerie. Lots of cool techniques. What great fun. My favorites are Peanut Butter Cups. Cute project! My favorite Halloween candy? That's easy - anything chocolate! Beyond wonderful! LOVE the tip on using collage medium over the rubs...I'll have to remember that! You had me at that bone...love it! Cute and festively fun projects! Love this project! Was there a winner? I think I missed it lol.